Tired of grey and black colored Flash drives? 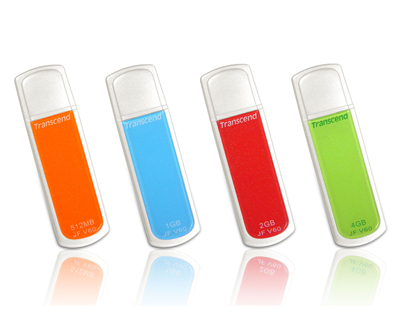 USB flash drives are now candy colored thanks to Transcend’s Jetflash V60. The drives are available in four colors, with each color corresponding to a different storage capacity: orange is 512MB, blue is 1GB, red is 2GB and green is 4GB. All the Transcend drives come with basic security software including a program capable of locking your PC from prying eyes and wayward fingers alike. A Transcend press release for the Jetflash V60 claims that “Now everyone can transfer to a paperless society.” Yes, Western civilization was just waiting for the V60 to appear in order to be convinced that a paperless society was viable.